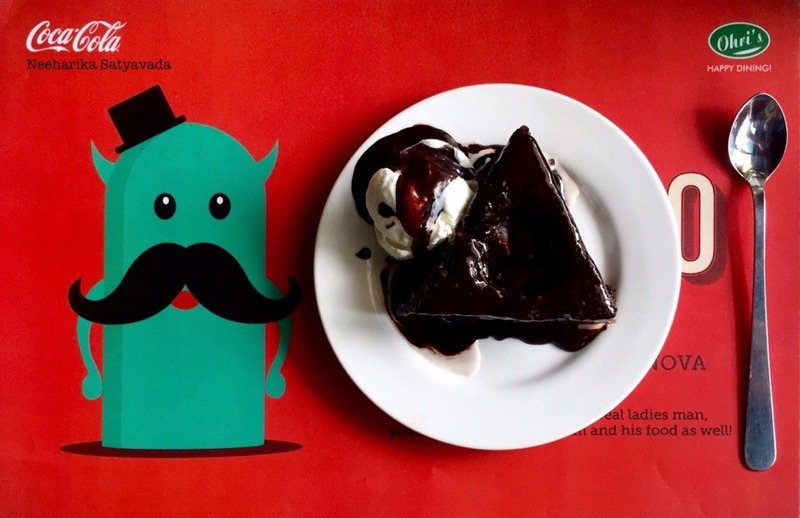 A tour of the most delightful desserts in Hyderabad. As always, I start with my favourites. First on this Dessert Trail, Eatmor at Ohris has been my go-to place, not just for desserts but for everything from fries & sandwiches to 4-course Chinese meals. The meals did happen in a different storey, but nonetheless at the same Ohris. I have been binging on their Bulls Eye & Awful Awful from when the place was called Havmor & did not have buffet lunches!! Well, that brings in the crowds these days, but that shouldn’t deter you from trying out their shakes & desserts. They are still the best in town. Here is Eatmor’s version of Death by Chocolate – The Bulls Eye. This one is an everyday classic with soggy soft chocolate cake and vanilla ice cream dripping with hot chocolate fudge. This was my favourite for 6 years (yes, 6!) till I moved onto Awful Awful. & then there was no looking back. A tall glass of vanilla ice cream, loaded with cashew nuts & chocolate fudge. Need I say more? also, that it is a category unto itself!! After a personal favourite, here comes a general favourite. Second on this list, Conçu is Trending in Hyderabad right NOW! This sweetly done up place will make itself your own from the time you step in. A dessert-only place, it calls for indulgence right from how all those different desserts are lined up for you to choose from, to how the ones you choose are set on a wooden platter for you. A perfect #flatlay Photo Op, for all those food photographers & Instagrammers! Well, here is a lowdown of what I liked from all those desserts I tried here over two trips. Hollywood. Well, that is how it is named! Anyways, a baked american cheesecake that doesn’t taste much like a cheesecake, but has some really quirky toppings like caramelised popcorn and cola flavoured marshmallows which make it intriguing. The Red Velvet Cupcake. This needs no introduction, Red Velvet is a classic & when it comes in a cupcake, it is a winner all the way. Sea Salt, Caramel, Chocolate Tart. The one dessert that I will always make it a point to have every time I go to Concu. You wouldn’t be disappointed in this one. It tastes just as compelling as it sounds! Delectable chocolate mousse filling, topped with delicious buttery salted caramel & finished with bits of vanilla chocolate sponge, chocolate & sugar rolls, in a crumble crust. Here are those plates (well, really saucers from the cups used in the chandelier). Blueberry Cheesecake. Undoubtedly the best cheesecake I have had here in Hyderabad, this ties for the best dessert here with the coffee eclair. It is baked perfectly, down to the tee, or rather down to the crunchy biscuity crust. Chocolate Macaroon in THE plate. ‘Interesting’ is all I have to say for this one. Another red velvet dessert, The Red Velvet Tiramisu. Light and delicious, this eggless dessert from Kavanah is refreshing. Trailing in the booming popularity of dessert-only places in the city, Kavanah opened up recently. But, is more than just a patisserie, with a range of other quick bites, in a place that is large and well laid out. The Chocolate Chunk Muffin is a must try here, purely for the big chunks of chocolate in it. Their Chocolate Mousse is good too, with a hint of citrus in the creamy chocolate. and, I end this dessert trail with two desserts from Olive Bistro. The place is fancy no doubt, but the desserts are not too great to taste. These pictures have made it to the list only for the sheer experience of how the Olive Bistro looks! & also because of how they have been designed and presented. OB’s Insanity Slice, is an ice cream cake with alternating layers of ice cream and cake, topped with rich cream. Sadly, it fails to live up to how it sounds & looks. Macaroons. Again. Blame Gossip Girl. & That was ME, Sugar Rushed in Hyderabad!